The Riversage Scenic Loop is located in the Dennis Weaver Memorial Park near Ridgway, Colorado. The trail begins about a quarter mile from the parking area at the end of the Stagecoach trail where it makes a loop to the west that takes it up and over Boot Hill. Portions of the Riversage Scenic Loop are on private property so please stay on the designated trail. 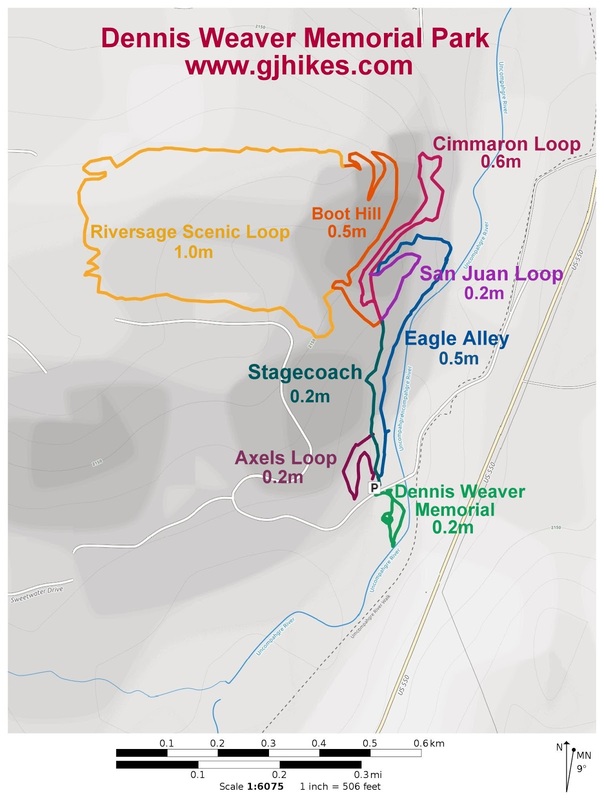 For this post we picked up the Riversage Scenic Loop from the summit of Boot Hill and continued around the loop in the counterclockwise direction to get back to the Stagecoach trail. As the trail drops off the west side of Boot Hill it enters private property. From there the trail travels next to a fence line. A sign cautions about a steeper grade as the trail continues. This part of the trail is a little more secluded than the rest. A moderately steep hill comes up that leads the trail out of the secluded area. The moderate but short climb leads up to a ridge where there are some decent views of the San Juan Mountains. The trail begins working its way down the hillside after crossing the ridge. For the rest of the distance the trail works its way heading eastward through the sagebrush. The loop comes to an end at the point the trail heads up to Boot Hill. From here it is a short distance back to the top of the Stagecoach trail where the Cimarron and San Juan loops begin. 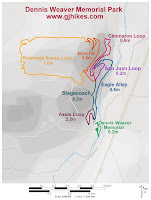 The Riversage Scenic Loop is the longest of the trails in the park. It can be completed going in either direction. While we went counterclockwise the other direction might be easier if mountain biking. If you would like to see it for yourself then all you have to do is grab your bike or 'Take a hike'.